LISA Pathfinder, a major effort to search for gravitational waves beyond Earth, launched on December 3rd, 2015. But those few minutes of space inferno actually takes much, much longer to prepare. Thankfully, the European Space Agency lets us see the three-week process boiled down to about three minutes with crews busily prepping Lisa for its early December launch. 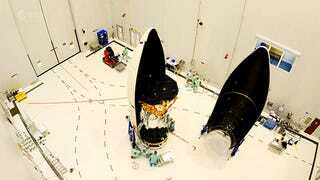 The timelapse starts all the way back on November 12, as ESA begins the laborious process of spaceflight. Here’s the tick-tock breakdown of what you’re seeing up above via ESA. Over this period, the spacecraft was attached to the payload adaptor of the Vega launcher, encapsulated within the half-shells of the rocket fairing, transferred to the launcher assembly area, and installed on top of Vega inside the mobile gantry, which was withdrawn shortly before liftoff.